Eight years ago, after accidentally smashing my 24-85mm lens on a hiking trip, I narrowed its replacement down to two Canon lenses, a 17-55mm lens and a 24-105mm lens. The 17-55 was a better fit for my crop camera but making some guesses at Canon’s future plans I figured I would be moving on to full-frame within a couple of years, and so ordered the 24-105 lens. Looking back I might have made a mistake for I’m still shooting with crop cameras. My reasons for thinking I’d be moving to full-frame weren’t far off, it’s just that it was Nikon who went down the path I thought Canon was going to take. While I like my SLR (the Canon 7D II) quite a bit, I’ve been increasingly frustrated by the limitations of my Canon M mirrorless camera (I guessed wrong on what Canon would do with that system as well), but am not quite ready to commit to a different system yet, so in the meantime I adopted a stopgap solution. The lens I bought was a Sigma 17-50mm f/2.8 lens, similar to the Canon 17-55mm I looked at all those years ago, but it was both vastly cheaper (it was on sale for the holidays) and can focus closer, important for the pet photography that will be one of the primary uses of the lens. 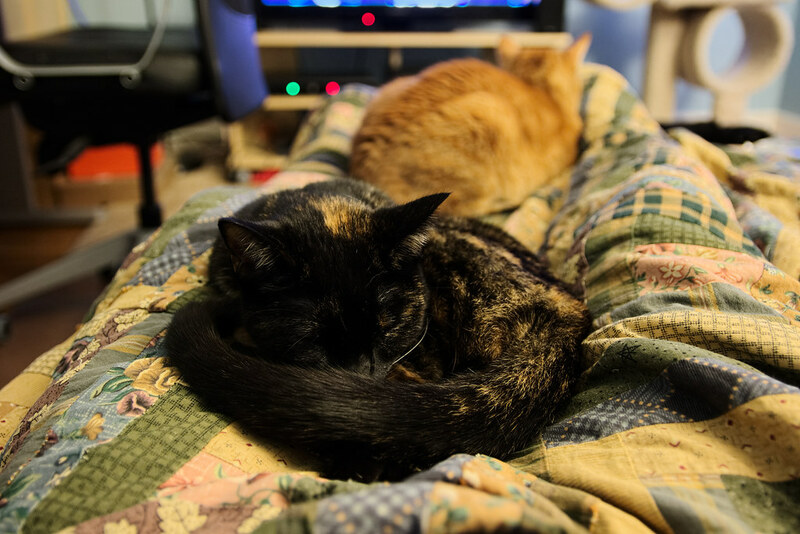 This is our youngest cat Trixie curling up (literally) on my lap while our oldest cat Sam sleeps on my feet. The 7D II I will use it on is much larger and heavier and noisier than my M, but it has a nice Live View mode that lets me hold the camera away from my eyes, and the Sigma strikes a nice balance in being almost as fast as my prime lens on the M, but with the image stabilization of the zoom. This picture was taken at a quarter of a second in the dim lighting of my office, so a fast aperture and image stabilization let me get a picture I often couldn’t get before. While Canon has been moving in a different direction than I’d prefer on several fronts, I’m very thankful for my cameras, it’s remarkable what we can do today compared to when I started in the mid-90’s. Sony is getting pretty close to having a camera that does most of what I want, and rumors are Canon may get serious about mirrorless next year, but in the meantime the Sigma should tide me over. 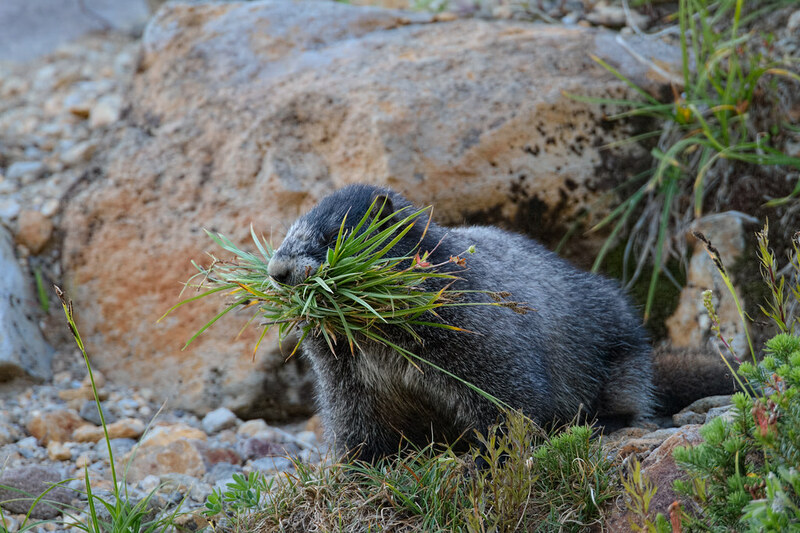 A hoary marmot collects grasses and flowers late on a fall day in Mount Rainier National Park. I didn’t think it could add more without dropping what it already had, but I was wrong. 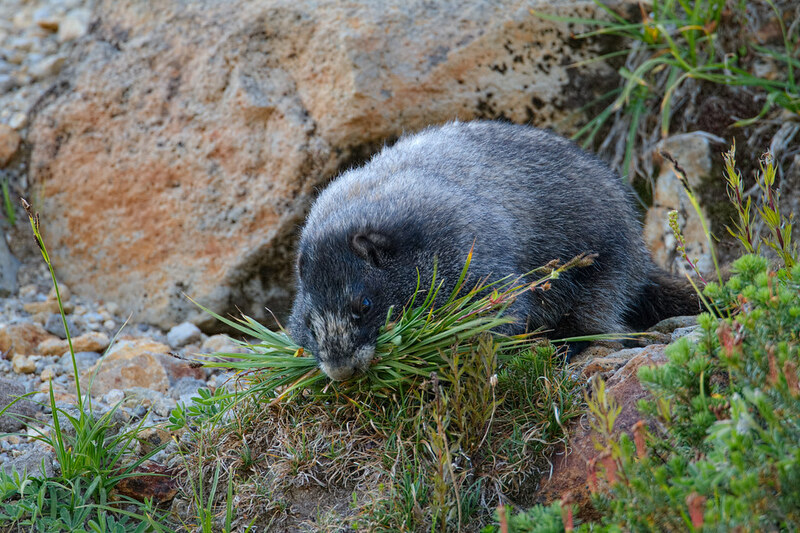 After adding that last bit it was either satisfied with its collection, or felt unable to collect any more, and trundled off towards its den. Trixie using Boo as a pillow. 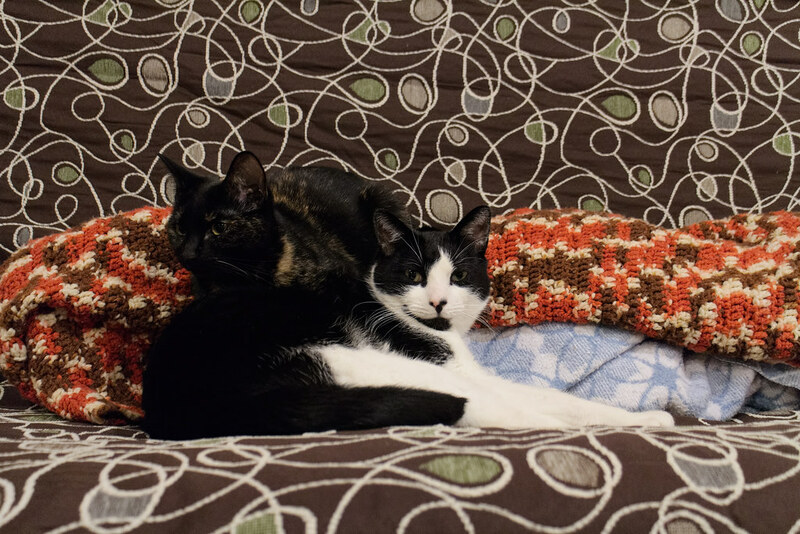 It took a long while to get Boo to accept Trixie, but our two youngest cats are now friends and can frequently be seen (and heard) running and playing throughout the house. Even so I was a little surprised that Boo let Trixie climb on top of him as they took a nap. 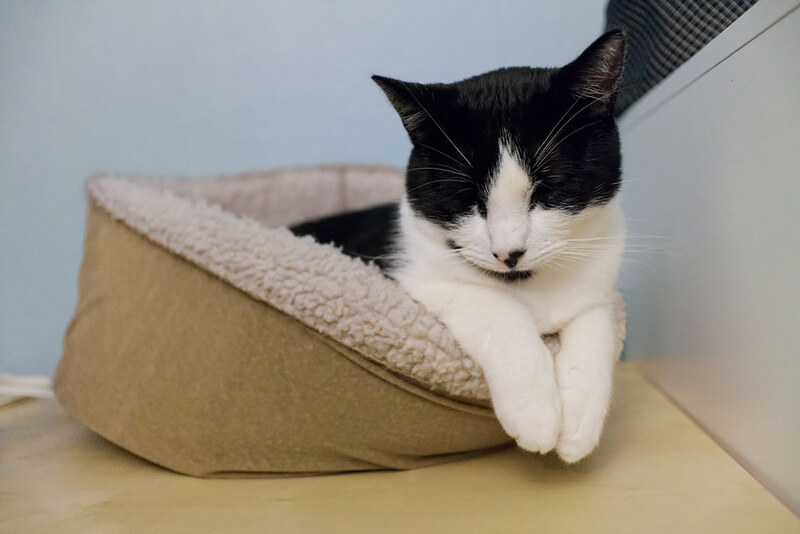 This was Scout’s beloved cat bed. It’s probably best she didn’t live to see it used in such a disgraceful fashion. Between being overly tired or sick, I’ve spent a lot of time this fall not doing much of anything but sitting on the couch covered in cats. It was supposed to be an easy year for me at work but my project proved unexpectedly difficult and left me mentally tired at the end of the day. To top it off traffic, which has been getting steadily worse since we moved to Portland years ago, crossed a threshold this year and I’m spending almost as much time on the road (and sometimes more) as when we used to live much farther away. By the time I get home and take Ellie on her walk, eat dinner, and take care of the cats, I’m so tired I fall asleep on the couch surrounded by the little ones. On the weekend I just want to let my brain shift into neutral and not think about much of anything. Making decisions, even minor ones, has gotten more difficult, so I put off what I can. I haven’t been hiking at all this year apart from a few days in January, at first because I didn’t feel up to it after Emma died and later because I was either too tired or didn’t want to get back in the car after dealing with traffic all week. The past couple of months it feels like I’ve been sleepwalking through my life. I’ve had this post half-written for weeks but stringing nouns and verbs together didn’t sound too appealing in my free time. It wasn’t a conscious decision but I realized I not only wasn’t taking pictures, even of the pets, but wasn’t editing my backlog, usually a favorite way to pass the time. I’ve taken a few days off to extend my Thanksgiving break and am starting to get back on track. I’ve been able to get a bit more sleep, and this weekend I was back taking pictures of the pets. No hiking yet as I hurt my foot, it’s nothing serious but it hasn’t mended enough to risk it on the trails quite yet. It’d probably heal quicker if I stayed off it and stopped taking Ellie on her walks, but I can’t give that up, it’s one of the best parts of my day. 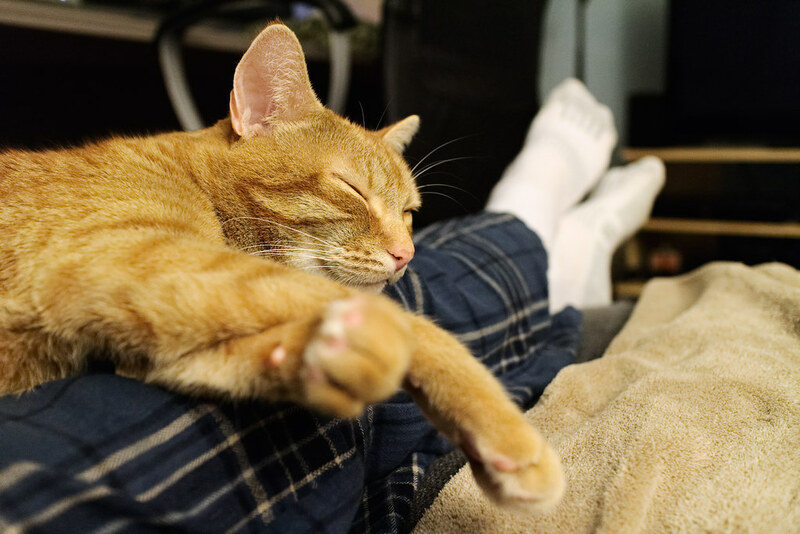 This picture of Sam sleeping on my legs is from September. He and Trixie are curled up on my legs at the moment, with Boo beside us and Ellie asleep in her dog bed below my feet.